Guitarists begin by learning how to play only single-string melodies. Learning how to play double-stops on the guitar lets you use the whole neck to express your musical ideas. In fact, playing double-stops is a great way to play in harmony with yourself. A double-stop is nothing more than two notes that you play at the same time. It falls somewhere between a single note (one note) and a chord (three or more notes). You can play a double-stop on adjacent strings or on nonadjacent strings (by skipping strings). You don’t need to do anything special in fretting the notes of a double-stop. Fret them the same way that you do chords or single notes. Playing double-stops on the guitar is a great way to enhance your playing. Double-stops make your guitar melodies sound sweeter and richer and your riffs sound bolder. After you’ve learned the basic mechanics of playing a double-stop, you’ll want to devote some time to practicing this technique so you can use it to its fullest. There are two general ways to play double-stops: You can play double-stop passages using only one pair of strings (the first two strings, for example) — moving the double-stops up and down the neck — or in one area of the neck by using different string pairs and moving the double-stops across the neck (first playing the 5th and 4th strings, for example, and then the 4th and 3rd, and so on). For this exercise, start with a C-major scale that you play in double-stop thirds (notes that are two letter names apart, such as C-E, D-F, and so on), exclusively on the first two strings, moving up the neck. The following figure shows this type of double-stop pattern. To follow this pattern, start with your index finger for the first double-stop. (You need only one finger to fret this first double-stop because the 1st string remains open.) 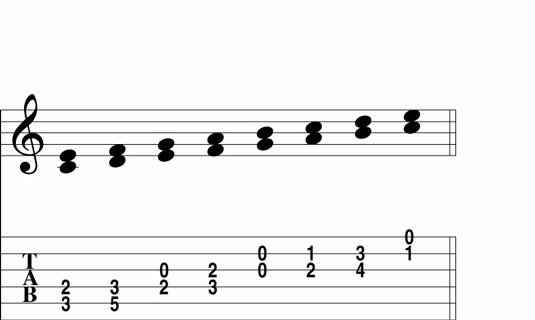 Then, for all the other double-stops in the scale, use fingers 1 and 3 if the notes are two frets apart (the second and third double-stops, for example) and use fingers 1 and 2 if the notes are one fret apart (the fourth and fifth double-stops, for example). With your right hand, strike only the 1st and 2nd strings. Playing double-stops across the neck is probably more common than playing up and down the neck on a string pair. The following figure shows a C-major scale that you play in thirds in open position, moving across the neck. Again, this figure doesn’t show the fingerings for each double-stop. But you can use fingers 1 and 2 if the notes are one fret apart and fingers 1 and 3 if the notes are two frets apart. 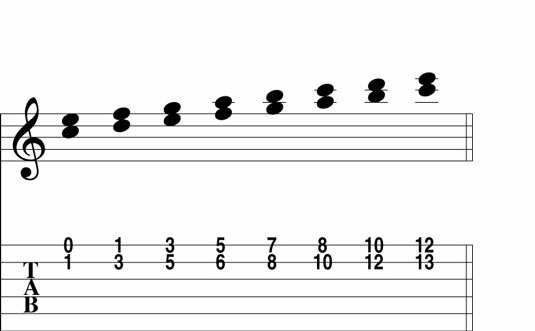 Especially common in rock and blues songs are double-stops across the neck using two notes on the same fret (which you play as a two-string barre).